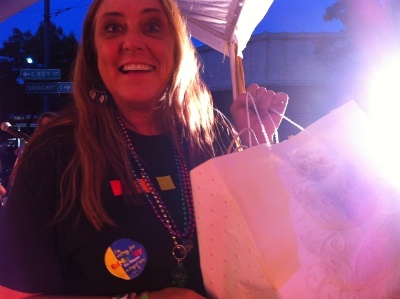 Torgeny Vlamis wins the Capitol Hill Pride Festival 2014 Gift Basket! as one of the highlights of the night. One of the best talents in the Northwest. Indecent Liberty Christi Michelle and Mark Johnston perform "I've been Bad" and cover "Royals" with Bluesy notes and growls at the 2014 Capitol Hill Pride Festival. An amazing singer, newly discovered Christi Michelle's powerful jazzy voice with an occassional growl is having listeners liken her to Adele. Ayron Jones, considered one of the best guitarists in the Northwest at the main stage. Greatness comes once in a blue moon and you will see this in Ayron Jones. Seattle singer, songwriter, guitarist Ayron Jones (pronounced "A"-ron), describes his music as "Urban Rock" - blues with Hip-Hop, think Stevie Ray Vaughan meets Nirvana. Ayron Jones, once opening up for B.B King, Ayron is described by Sir-Mix-a-Lot as "Easily the best talent in Seattle right now.” - Sir Mix-a-Lot If you can catch a performance, don't walk, RUN to see this Hard Blues Artist. 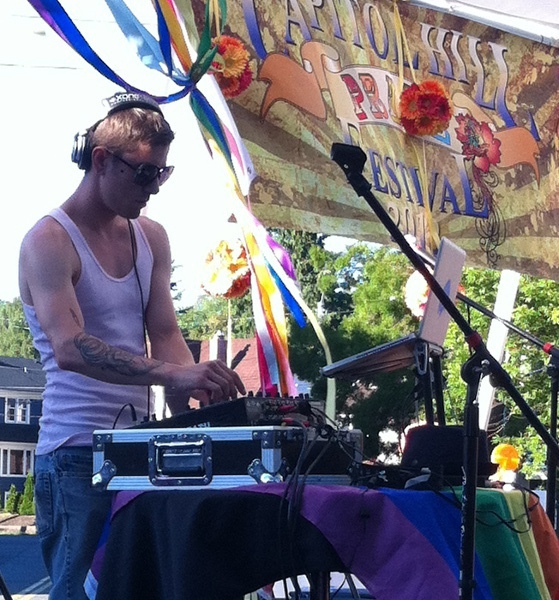 Niccolo Chopper (Tin Man) Joshua Sibley braves the Seattle rain and belts out an original song from the Wonderful Wizard of Oz - A New Musical at the 2014 Capitol Hill Pride Festival main stage. 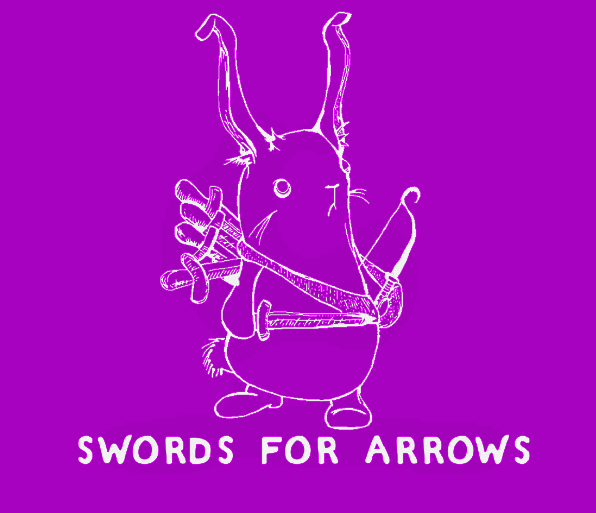 The new musical is set for a full theater performance at the Historical Everett Theater Oct. 31-Nov. 23, 2014. Get your tickets soon for what is sure to be a sold out showing! www.historiceveretttheatre.org I hope he doesn't rust! Who has the largest smile? Congratulations! The top five winners with judges and MC Gina of the Seattle Humane Society. More information below. 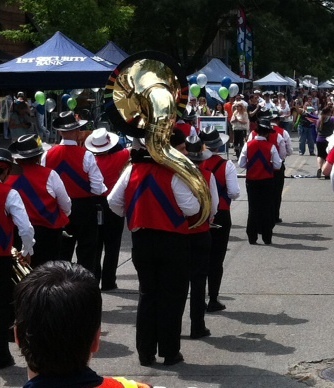 Rainbow City Band opened the festival while a small rider watches. Ayron Jones, considered one of the best guitarists in the Northwest at the main stage literally stopped traffic and attendees with his performance. The Nasty Habits have entertained bar, private event, and casino audiences for over 10 years. They return to the festival again this year with high energy rock, glam, new wave, and punk dance covers from the 80's and beyond. Nasty Habits band packs the street with their 80s renditions and Nirvana's Teen Spirit. Pet Project, an offshoot of the Pet Food Bank, provides services to individuals disabled by AIDS. Pet Project matches volunteers one-on-one with clients, handling most of their pet care needs on a monthly basis, and enables clients to keep their pets while spending their limited resources on food and other living expenses for themselves. All services and supplies are donated or purchased with donated funds. Individuals disabled by AIDS should contact Pet Project at (425) 649-7566 to be considered for Pet Project services. Pet Project is funded in part with a grant from the Pride Foundation. 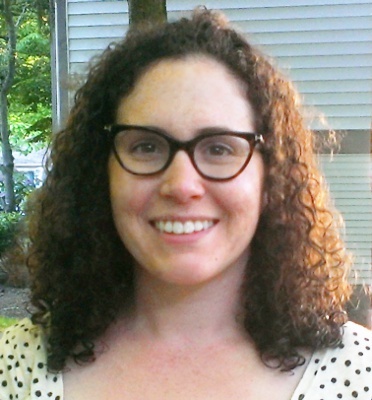 Gina is the Community Outreach Coordinator at Seattle Humane Society. She oversees the Pet Food Bank, Pet Project, Visiting Pet Friends and Pet Loss Support Group. Her favorite companion animals are small Dachshunds aka wiener dogs and Siamese mix cats. Contestants line up including the Wells Fargo Dog. Congratulations! Photo by Jake Varga. 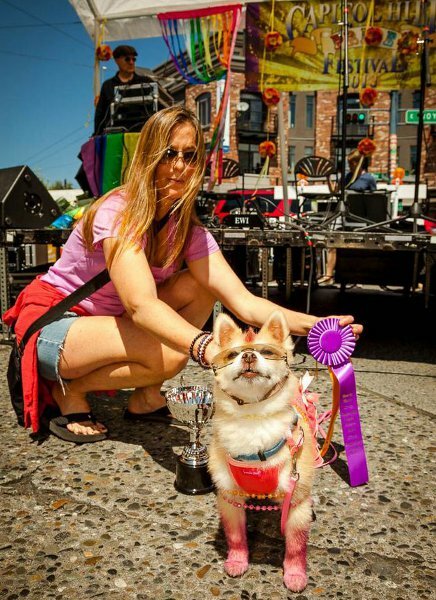 Barita takes Best in Show for the 2013 Doggie Drag Costume Contest! 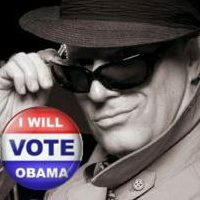 Photos courtesy of Jennifer Durham. 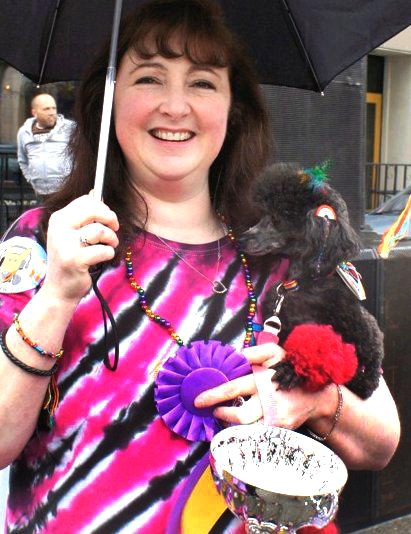 View Rebecca Murray's Video of the 2011 and 2012 Doggie Drag Costume Contest! Congressman Jim McDermott awarded the trophies. Thank you all for a wonderful event in 2013! 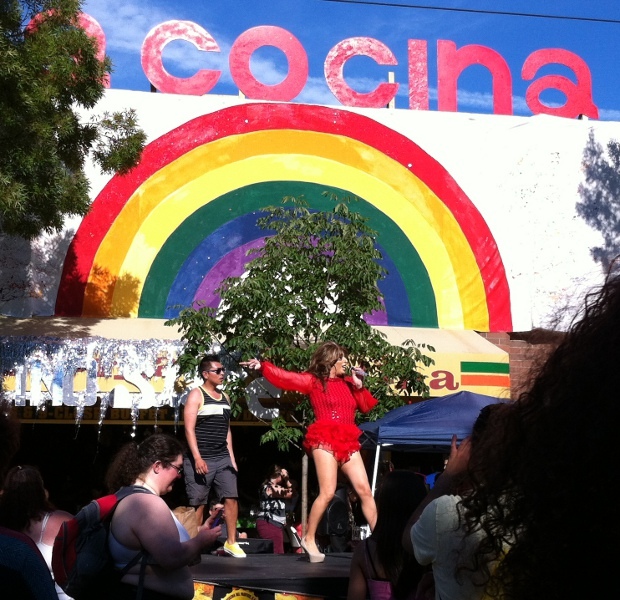 Pride History has been made! 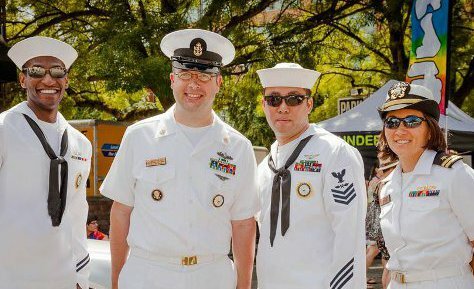 For the first time in Northwest Pride History the US Navy made an appearance in uniform! 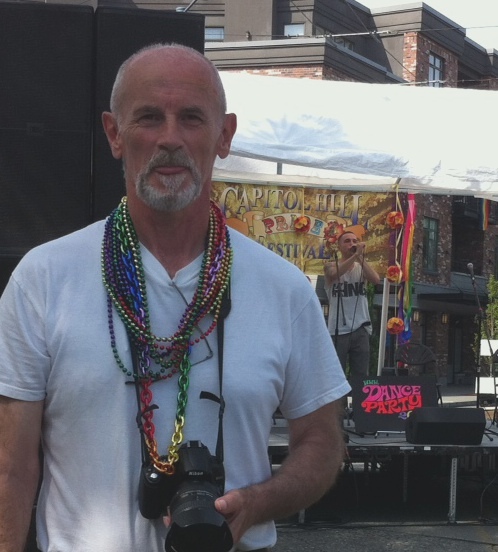 historical first appearance at the Capitol Hill Pride Festival. 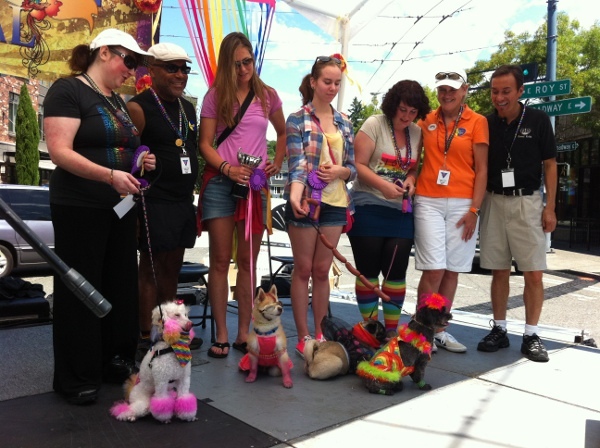 Doggie Drag Contest winners with judges. 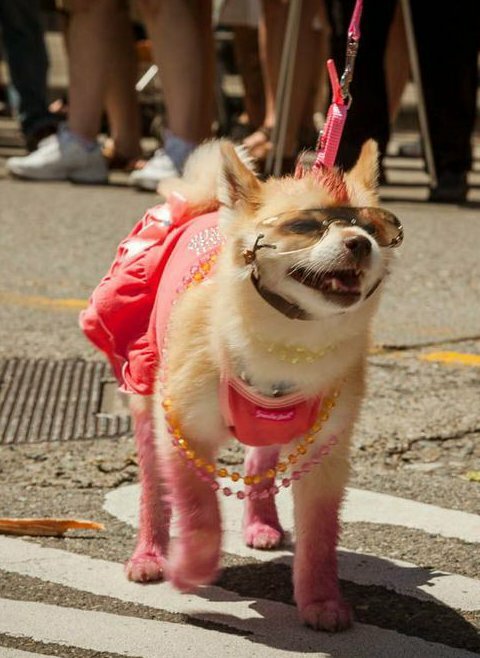 Best in Show for 2013 is Barita - the pink attired mohawk pooch in the middle. 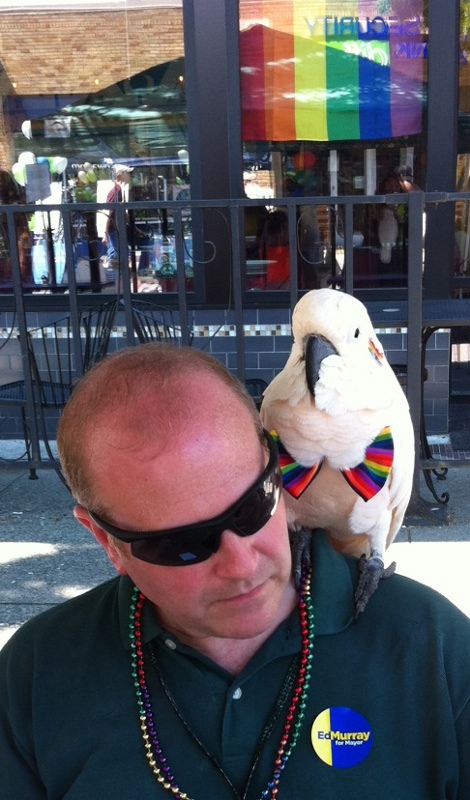 Judges Jeff Hedgepeth of the Seattle Pride Foundation, Joey Reiter of the Seattle Humane Society and Count Kody. Thank you to Jocelyn Shope of the Seattle Humane Society for hosting and MCing! More photos below! 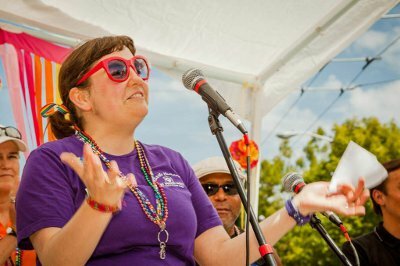 "Same Love" singer Mary Lambert makes a surprise appearance! Mary Lambert joins in on the Sing Along to her own song with Takeshia Seward. Mary Lambert shared her experiences and spoken word. She encourages everyone to "Hold hands"! 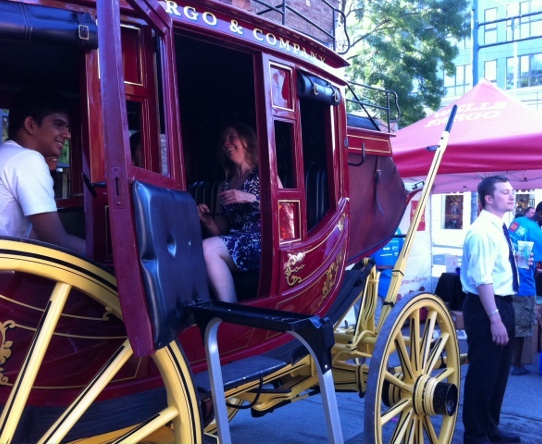 A couple enjoy the Wells Fargo Coach. Click on Video above to watch. Massive Monkees performs at the 2010 Capitol Hill Pride Festival demonstrating their Internationally award winning style. One of their best street performances as the stage was too small, the group performed for the crowd on the street.